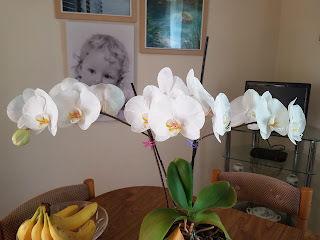 Yesterday I posted an image of my pride and joy a Moth Orchid which was bought from my local Garden Centre for a fiver. there was such a lot of feedback along the lines of how did you manage it? I decided to post this blog. Because I still am a novice (even after a couple of years), I asked for help from my cousin Cath who has successfully had these beautiful flowers for a long time. Her advice was pick a day and once a week on that day give your plants a spoonful of water allow it to drain away, place then in a good spot, feed them once a month and ignore them! Now up until now my family have known me to be the devil incarnate with potted plants, and cut flowers have always had to short a lifefor me. Orchids on the other hand seem to flower for ever!! Today Tuesday is my designated orchid day. I decided to have a go at this video lark to show off my collection and maybe help others with the orchids they have been given as presents! This was it when I rescued it. It has been a hectic last few months but getting settled again and have an update on my number one orchid. It has bloomed lost the blooms and is now back in bloom. I re potted it as it had outgrown its 17cms pot and is now in a 19 cms one.